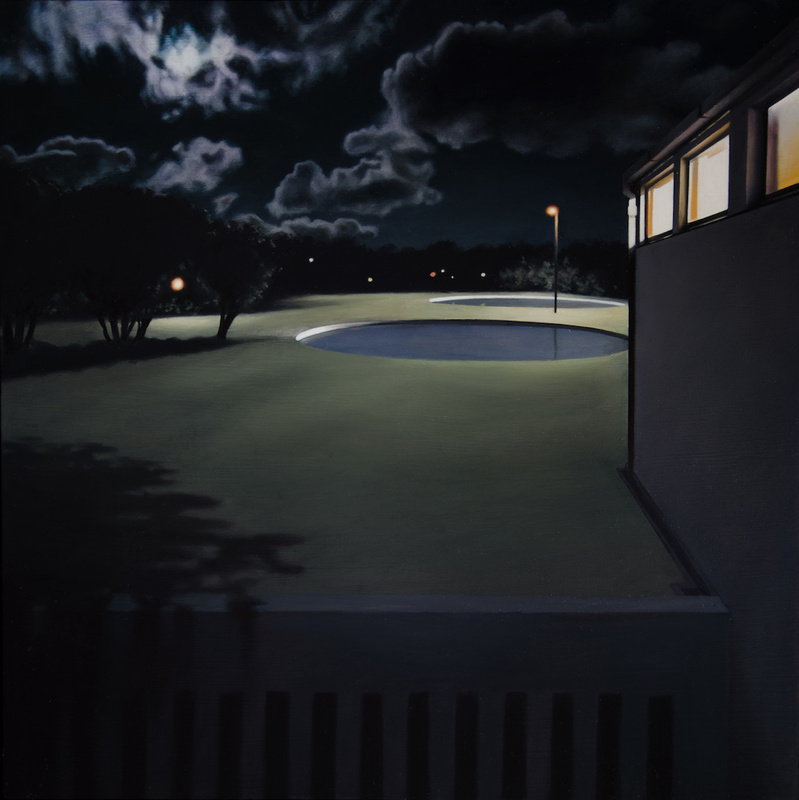 In Gina Heyer’s most recent paintings of night swimming pools and moonlit courtyards, a moment of calm is distilled in paint, but that silence and stillness balances precariously on the edge of something more ominous. These spaces emerge as recurrent dreams where familiar scenes are revisited but each time something is altered. As spaces of transition and passage they urge the viewer to pass through, a reminder that one’s stay is temporary, and yet there is an urge to linger. The viewer’s gaze stalks the night and probes the dark spaces in search of something. Perhaps that something is just a feeling or an absorbing of a fully present visual moment; an observation of light interacting with solids and liquids, like visual alchemy. The paintings purposefully bring the seamless illusion of space and depth into tension with their flatness as almost paper-thin veneers on flat and floating boards. Mundane and familiar spaces become beautiful and strange when stilled and eternally fixed through the slow and painstaking layering of paint.